Vintage Clothing Blog | Vintage Wedding Dresses | Salvage Life: Salvage Life on the TODAY Show!!! Salvage Life on the TODAY Show!!! Salvage Life was featured in a Secondhand Shopping segment with Bobbie Thomas on the TODAY Show last Friday morning. We were so thrilled to see our necklaces on screen and hear Bobbie talk about Salvage Life! You can watch the clip featuring Salvage Life below. To read the article and watch the entire segment, go here. Congratulations to...Catrina, she won a $25 gift certificate! She answered the question in the last post correctly, all four necklaces were there, they were layered on the second mannequin. Congratualations!! Wow, national exposure. 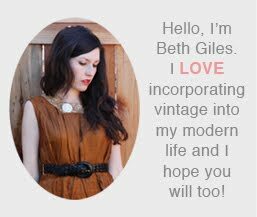 How great to see people loving vintage more and more. You represent us well. Thanks.